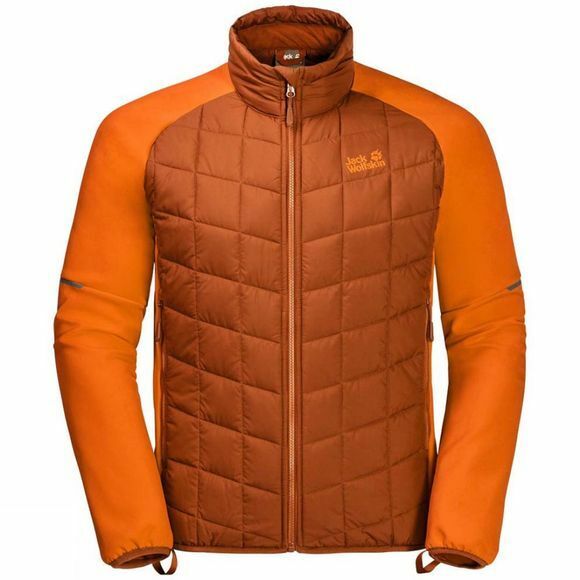 The Mens Grassland Hybrid Jacket from Jack Wolfskin is the go-to Jacket for High-output activity In cold weather, the Grassland Hybrid Jacket gives you the warmth you need when you're pushIng hard on the Trail. The Jacket combInes a Windproof and water resistant Shell fabric with functional Microguard Ecosphere. The Insulation performance of this recycled synthetic fibre material is not compromised by dampness and wicks moisture effectively to the outside. For improved mobility, the sleeves and sides of the Jacket are made of a stretchy, Windproof and breathable SoftShell fabric. In really bad weather, you can simply zip the Grassland Into a hardShell usIng the system zip.